BuenaVo motion sensor solar light produce over 450 lumens to provide lighting and security to your garage, pathway and more. It has a 2200mAh battery and can work continuously over 12 hours, which is far more than other similar LED towns in the market.Updated PIR motion sensor to make sure it detects people within 26 feet! It becomes more durable and weatherproof with tightly sealed inner loop. And we also update the solar panel, thus getting a high-efficient, frosted, anti-scratch solar panel. Long press ON/OFF button for 3 seconds, the light turns on. 2nd press ON/OFF button, auto lights up in dim mode and turns into full brightness when motion detected within 26 feet. 4th press ON/OFF button, the light turns off. 3. We recommend the appropriate installing height should be 5.6feet-6.6feet. 4. For the first time use, please put the product under the direct sunlight charging for several hours before using. 6. If the lights is flashing, it means that the battery is exhausted, please recharge before normal use. 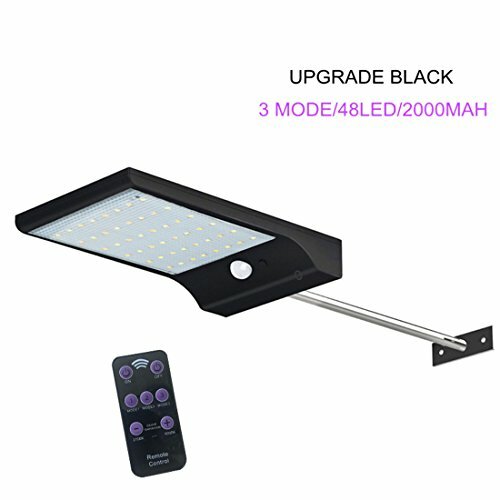 WHAT IS THE ADVANTAGE ABOUT THIS UPGRADED GUTTER LIGHT? - WITH REMOTE CONTROL -- Upgraded type solar light, with the remote control, you can choose and change the mode easily. 7 COLOR TEMPERATURE ADJUSTABLE -- This light provide 7 colors between white light and warm light, WHAT'S MORE? It has a upgraded remote control distance of 8 meters. THREE OPTIONAL MODES -- Mode 1: (Motion sensor&low lgiht - Low light when no people around and high light when people come.) Mode 2:(Motion sensor - No light when no people around and high light when people come.) Mode 3: (Always lighting - Automatic light on when night comes and turn to mode 2 after 3 hours.) MORE INTELLIGENT, MORE CONVENIENT. Choose the perfect mode according to your diverse needs. SUPER BRIGHT 48 LED SOLAR LIGHTS -- 48 LED Design provides a super bright level of illumination(500 lumens) for a wide area, which is much brighter than other similar solar lights in the market. WITH ALUMINUM MOUNTING ROD -- Unique mounting rod extending solar light out away from the eave that can not reach to direct sunshine, it help get max solar light. If you have any questions about this product by BUENAVO, contact us by completing and submitting the form below. If you are looking for a specif part number, please include it with your message. New Modern Half Moon LED Wall Sconce Light | Contemporary Sleek Circular Design | Frosted Fixture with Brushed Aluminum | 3000K Warm White Dimmable LED 12"